At Newcastle Integrated Physiotherapy we successfully assess, review and manage a wide range of musculoskeletal conditions from head to toe. Some of these injuries may be related to biomechanical imbalances, dysfunction, poor recruitment of muscles, poor posture or joints relating to injury. 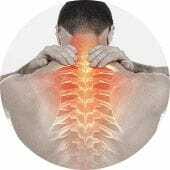 Often these injuries will involve nerves, joints and muscle tendons. Our Physiotherapists don't just review the symptoms of your injury, we focus on the underlying cause of the problem to allow you to live a pain free life.